We are committed to sharing this remarkable collection with the public, and welcome visits from groups and individuals. The Design Centre exhibition gallery is currently open to the public on Wednesdays on a drop-in basis, but visits can also be booked on other days by appointment to see the upper galleries and reserve collections. We encourage research activity and engagement at all levels. We are currently working with a number of educational institutions across the region including BA Art History students from Bristol School of Art. 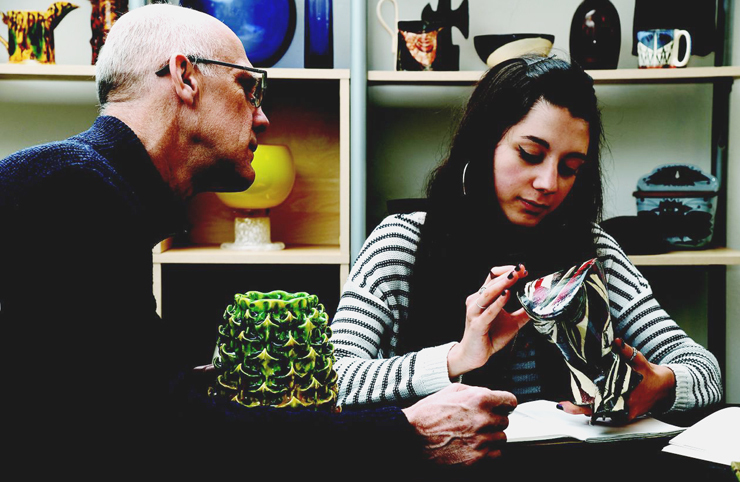 In 2016 second year ceramics degree students from Cardiff School of Art and Design took part in a project making work in response to pieces chosen from the Collection which culminated in a beautifully produced on-line catalogue published by issue.com. • Access to the Collection is by appointment (allow two weeks’ notice if possible). Wednesday, 10 am to 4 pm but may be arranged at other times. • Access to our research facilities is free. • Group research visits are limited to twelve persons. – see details on the left of the page.